Suffering from hair loss? Worried about your bald looking scalp? 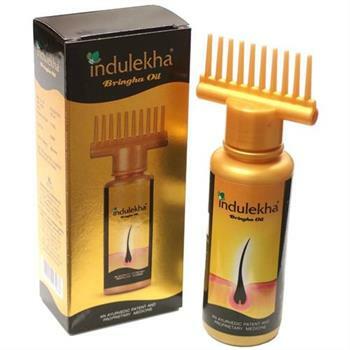 Thinking to try Indulekha Bringha Hair Oil? But does it give desired results? Here is complete review of this oil and its possible harmful effects. Hair loss is a very common problem these days. It can be due to genetic reason or due to depression or poor life style. Hair damage can also be a result of pollution or usage of products with harsh chemicals. Whatever the reason is, a person will voluminous hairs always looks more smart and attractive- be a male or female. Nowadays, many products are available in the market which claims to reduce your hair damage or hair loss. Indulekha Bringha Hair Oil is one of such products which claim to reduce the hair loss and premature greying of hairs and give you beautiful black shining hairs. It has various medicinal herbs which are believed to be effective for hair problem since ancient times. It mainly contains Bringha Aloe Vera, Amla, Neem, Yasthi, Karpura and Draksha blended in a base of pure and virgin coconut oil. Maximum Retail Price (MRP) of this product is Rs. 432 (100 ml. bottle). You can buy it from a local retailer near you or you can buy it online. It is available on many websites including amazon, flipkart, snapdeal, nykaa, etc. at attractive discount and offers. How to apply Indulekha Bringha Hair Oil ? The main advantage of this oil is it is easy to use comb style applicator. You can apply it yourself with its 'selfie' bottle. Each strip of comb has a minor hole at its end which releases the oil drop-by-drop. This oil spreads evenly throughout your scalp and enters into hair roots and follicles. You may pamper yourself with a gentle massage afterwards. You may like to wash your hairs next day as it is coconut oil based and leaves little stickiness in your hairs. It contains natural ingredients only which are believed to be effective since ages. It does not layer your precious hairs with harsh chemicals. It supplies essentially required nutrients and protein to each hair follicle. It gives you cooling effect after application, thus making you feel relaxed. As it is a coconut oil based product, it removes dryness from your scalp giving your hair a shiny texture. Its anti fungal properties helps to cure dandruff too. A gentle massage with oil improves the blood circulation and thus promotes hair growth. Hairs get fewer tangles as this product removes dryness from your hair strands. Remember that dry hairs always get more tangles. Various medicinal herbs help to fight against premature greying of hair. It provides an active control over hair fall, thus giving you voluminous hair. It is very not pocket friendly. Everybody can't afford it. You have to pay Rs. 432 for 100 ml oil. It's cooling effect may not suit you if you are suffering from cough, cold or fever. Coconut oil present in the product leaves stickiness in the hairs. You may have to wash your head daily if you are an office or college going person. Company and advertisements claim that new hairs grow after using this product. But most of the users have not experienced this, though their other hair problems are solved. It may not give you desired result if your hair loss is due to hereditary reasons. It has a very strong fragrance which you may like or dislike. Conclusion: Satisfaction rate of this product is 50%. This means 50% people remained unsatisfied after using this product. You may give a try to your loving hairs. Continue using the product if you get desired result and if your pocket allows you to use it in long term. I used Indulekha Bringha oil for the first time yesterday morning. Kept it for about an hour and washed it off. But last night my throat felt sore and I had a headache. This morning my voice had become quite hoarse. Should I continue using this. Its pretty expensive so don't want to waste it too. I used Indulekha for the 1st time and loved the results. I applied the oil at night and washed it off the following morning. For the 1st time in ages I did not lose a lot of hair as I generally do. My hair looked moisturied and a lot better. I am loving the product and would like to try the shampoo as well. Is the oil helpful to restore melanin in premature grey hair? I used Indulekha Bringha oil. Found it to be extremely effective and hence value for money. Due to my lifestyle I am unable to take proper care of my hair. As a result, my hair has become dry, dull, lesser in volume and has split ends. Even now I am not able to regularly use the oil but I make it a point to use it at least 6-7 times a month. And I can see the improvement and it is noticeable by others too. Is it beneficial to use Indulekha Bringha oil during pregnancy? Can I use it as it is my first trimester? I am using Indulekha hair oil but I don’t know why am I losing too much hair. Any idea?